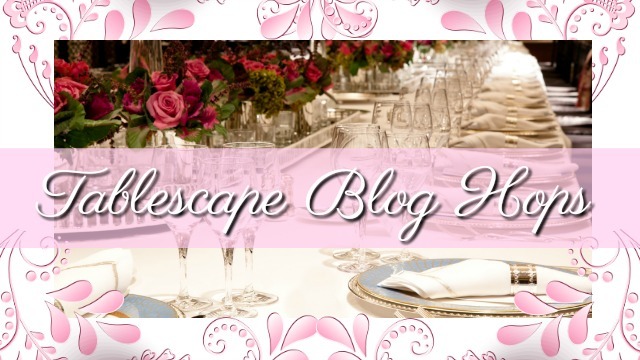 Welcome to another tablescape Blog Hop, organized by the talented Chloe from Celebrate and Decorate. 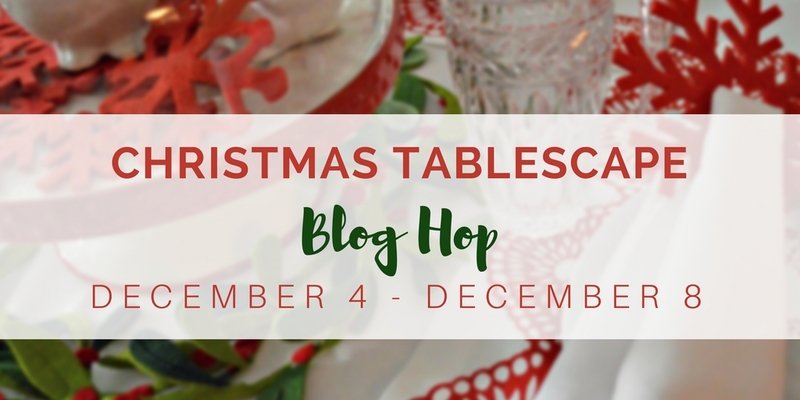 There are many creative bloggers who are sharing their lovely Christmas tablescapes. We hope you enjoy your visit and also be inspired. Since this theme is red, I set up a plaid tablescape in our Breakfast room. It has an awesome red ceiling to showcase this particular table. Lots of plaid going on here. From tablecloth to chargers and plates, plaid is the theme. I even found these darling tins with sweet doggies and more plaid. Mr. Moose breaks up the them with a little purple scarf. Green flatware and green goblets complete the table. 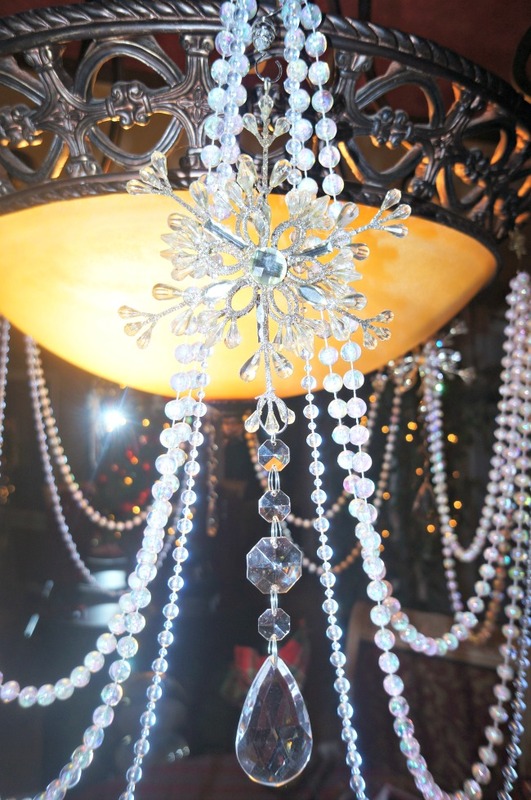 You know I love dressing our chandeliers. Strands of beads with snowflakes and crystals. I have two of these wall sconces, so I thought I would dress them as well. 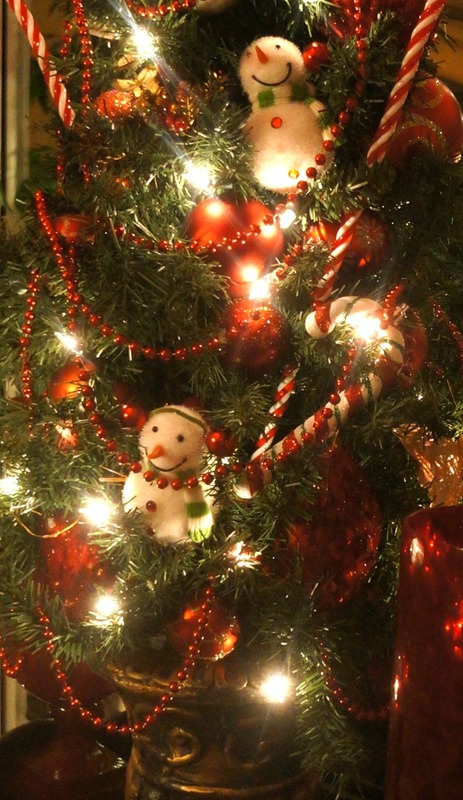 A sweet little tree decked out with snowmen and red bulbs. I do hope you visit the other ladies to see what they are up to. Happy holidays everyone! *I am running a little ragged here. My dad is at home and now on hospice. My Mother is sick with a bad cold, so I did some grocery shopping for them and made some soup. Stay healthy and happy. 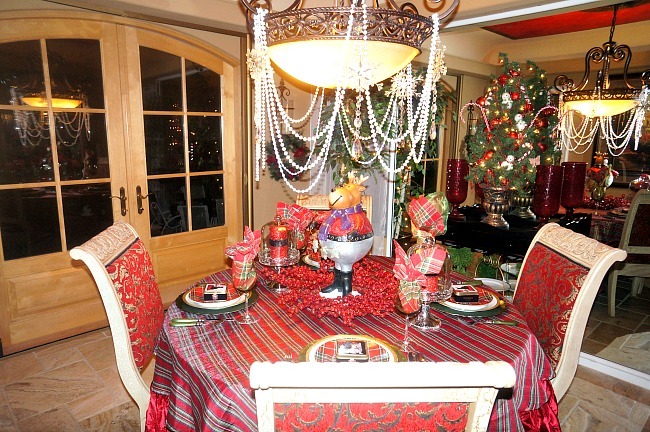 Linda, I love your plaid table and all the festive wall scones and chandy. Those are the cutest little doggie tins. Thinking of you and your parents. Take care of yourself. Those little doggy tins are so cute! Such a great table, love those chargers too. 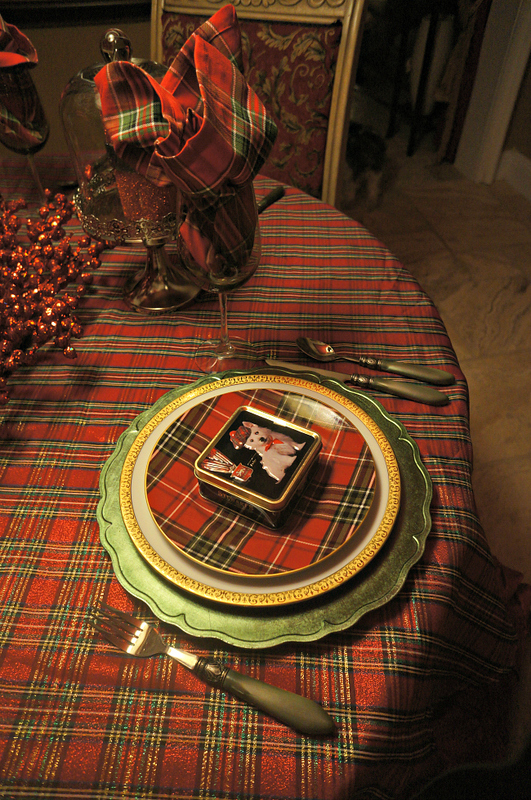 Fun plaid plates with the tablecloth, plaid is definitely the 'in' thing this year. Take care of yourself! Linda, your table setting was lovely. 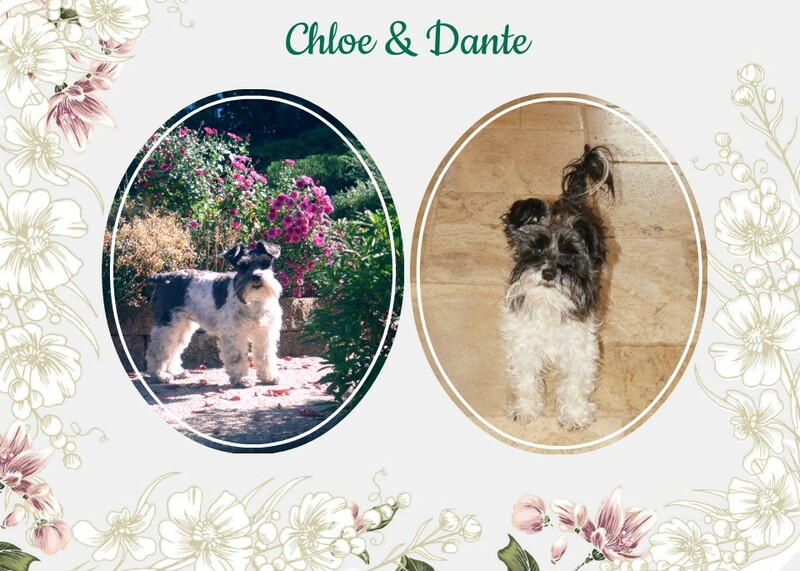 It seems there's a bit of a dog theme among our bloghop this time!! I love it (I have a fat spoiled pug!) Prayers to your father, and don't get too stressed during the holiday! 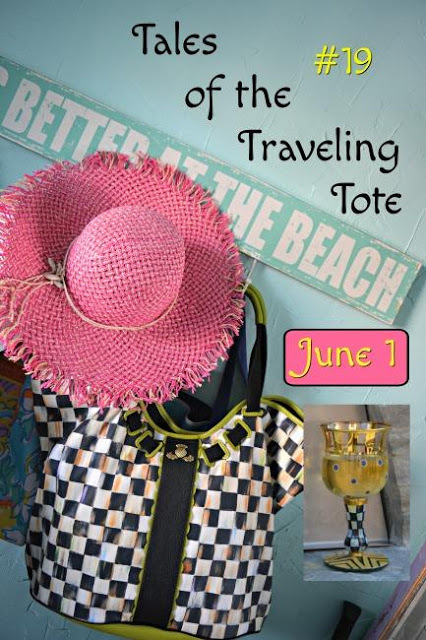 Enjoyed my visit from the blog hop, thanks for sharing. Just remembered I have a stash of crystal drops somewhere - need to go find them! I bought a little shortbread tin in FL:)You are so creative! 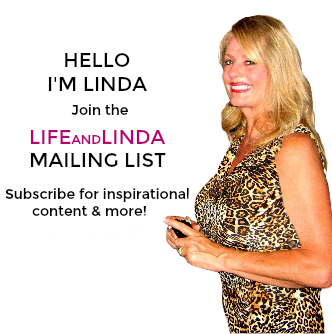 Linda, I am so sorry to hear about your dad! I'm praying for y'all. The shortbread tin with the Westie on it makes me smile. 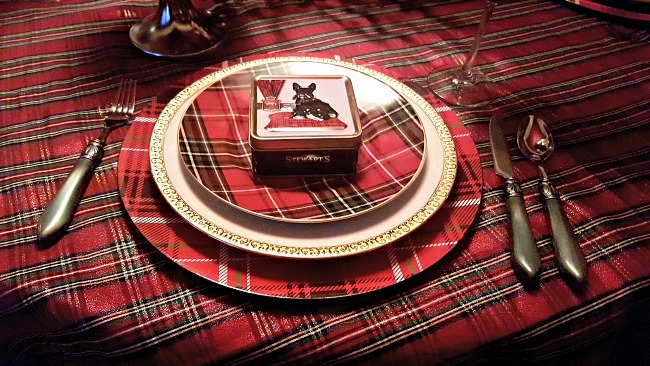 I love the plaid and Scottish theme of your table, Lass! Sending healing and loving thoughts to you and your family. 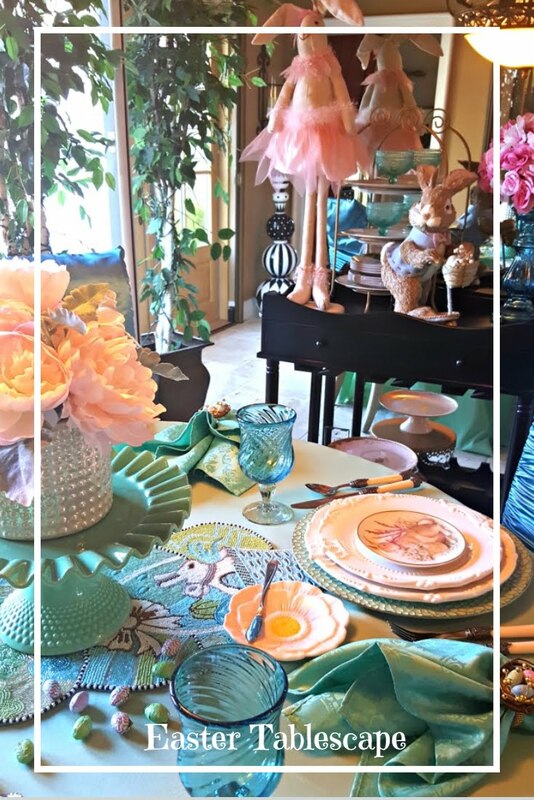 Thank you for taking the time to style this gorgeous table and share it with us. 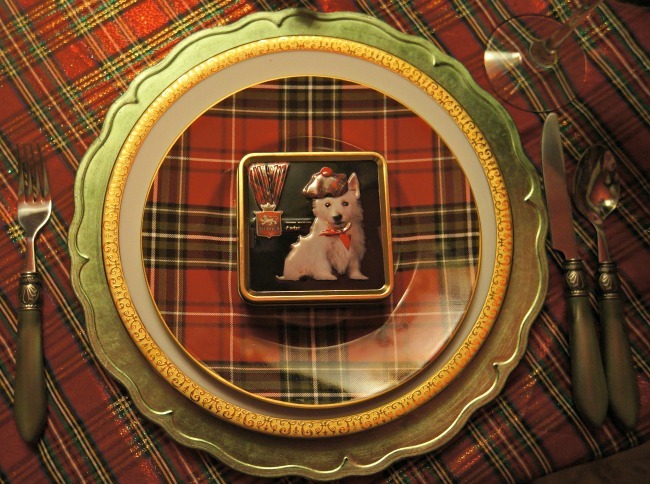 The Scottie tins are so cute and look right at home resting on the top of your stack. Take care and Merry Christmas! Linda, I know your Dad has been sick and I am so sorry to hear he is on hospice. Sending prayers for your parents and you as you take care of them. You can never have too much plaid, and I love your Tablescape! Love the doggie tins and your home is beautifully dressed for Christmas! Prayers to you Linda, this is a very rough time...I am amazed you've been able to do so much~ on a happier note, this table must make you smile, the doggie tins are so cute and the moose is adorable! Plaid is so perfect for Christmas! Linda, I am so sorry you are going through this very difficult time. You and your family will be in my thoughts and prayers. Your table is absolutely stunning! Every detail is just beautiful, and I adore the cute doggie tins. Take care! I like a nice dose of plaid at Christmas. I hope you find some time for self-care too as you cope with your parents at this difficult time. So sorry to hear about your Dad and Mom...it is especially tough at the Holidays but your table sparkles with beautiful plaid. Love the puppy tins and moose too. It is always fun blog hopping with you. Merry Christmas to you and your special family. Your tablescape looks beautiful, I absolutely love this scottish touch! Ps. My father too isn't well, my mom is tired and worried so I can understand. Please take care of yourself. Oh I love the plaid. Gigham check is a big thing this year. Oh, Linda, I love the plaid and as always,you outdid yourself! And, bless your heart as you care for your parents. It's a tough tough time I know. Hugs to you! I L♥VE the plaid Linda! 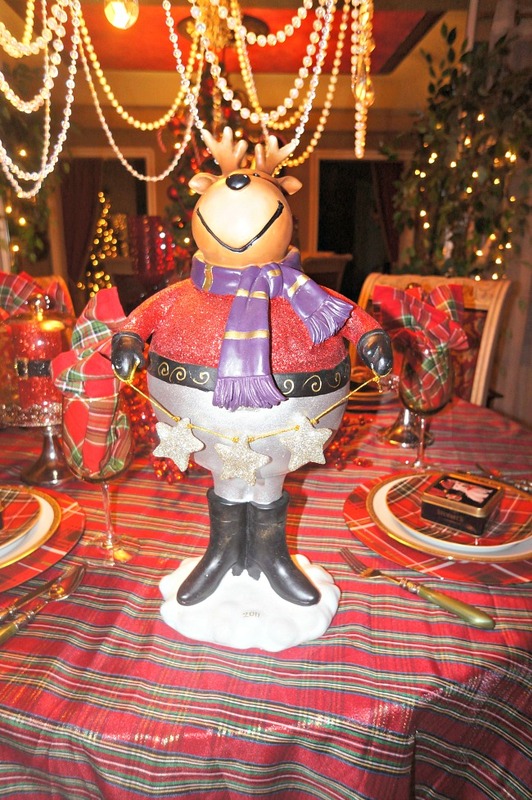 I love the doggie tins and Mr. Moose! I'm sure you will enjoy having meals at this beautiful table. 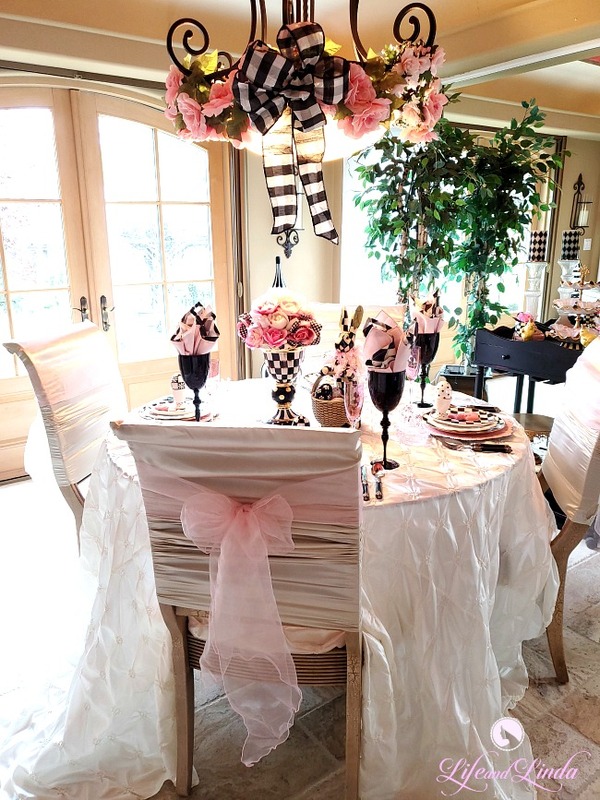 Fantastic plaid tablescape with so many wonderful plaid items! You've coordinated the patterns wonderfully and created a very inviting table. I think my favourite are those awesome plaid napkins in the stemware. 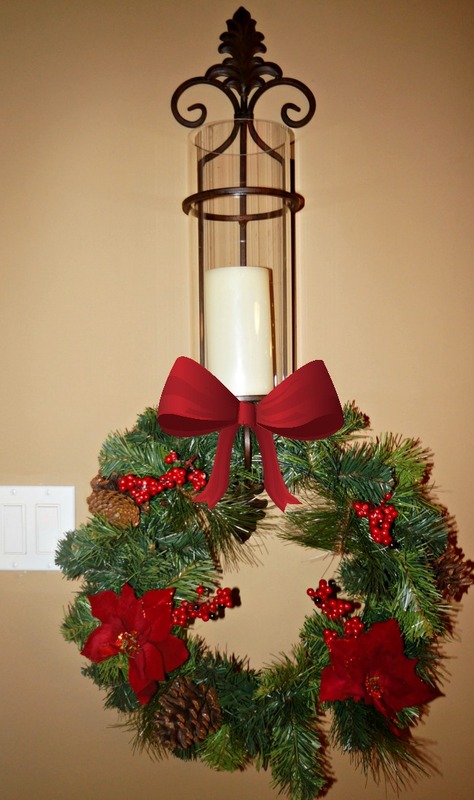 Your other Christmas decor in your home looks festive and well done. How terrific to have a room with red ceilings! Sorry to hear you have so much on your plate at this very busy time of year. Hope you get a bit of rest in the days ahead. I love that little scottie dog! SO amazing! The plaid looks amazing too. Lovely tablescape! Thinking of you and all that you have going on and sending a big hug. 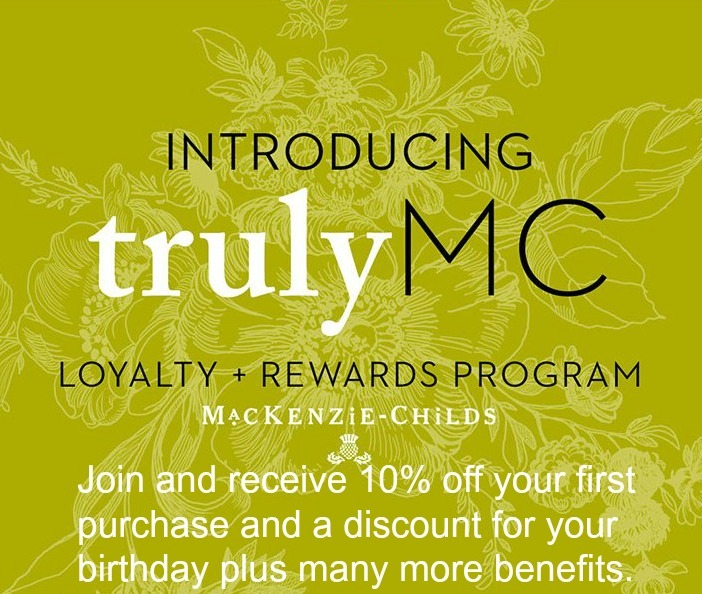 Your décor, styling and generous heart always shine through in all of your stunning displays. Love your plaid! And God bless your mom and dad, and you as caregiver. You must be having a difficult time. So try to tske care of yourself too! I'm so sorry to read about the health of your parents, Linda. You are such a good daughter and I know you have so much going on right now. Your plaid-themed tablescape is just beautiful, and the little tins are so special. Linda, I'm so sorry for your parents! Those little tins are just darling! I can imagine them filed with little delightful treats! Linda, great use of plaids and the hanging beads. Such a cute scene. Linda,your plaid details make me smile. I love plaid and tartan any time of year, but especially at Christmas! Love those doggie tins. Who makes those? Thanks for the links. I'm off to visit. Linda, what a cheerful and festive table! Those little scottie tins just seal the deal, don't they? I can only imagine the sight in taking in the table with your red ceiling...I am sure it is lovely. I know those who gather around that festive table are in for a wonderful meal. So sad RE: your Dad. I wish all of you better health. Linda, I love all that beautiful plaid, but for me the tins seal the deal! To have one on each plate for your guests is just too cute. I'm so glad to meet you through this blog hop. Wishing you a Merry Christmas, considering everything going on with your parents. Linda, I am loving the adorable tins with the dogs. Curious as to what you might put inside those, a favor or a place card maybe? I just love all the plaid going on this season, it is so warm and gives a cozy Christmas feel. Thank you for being part of the Christmas tablescape blog hop! loving all the plaid! Happy holidays friend.